We look back at an influencial force in bringing games locally. 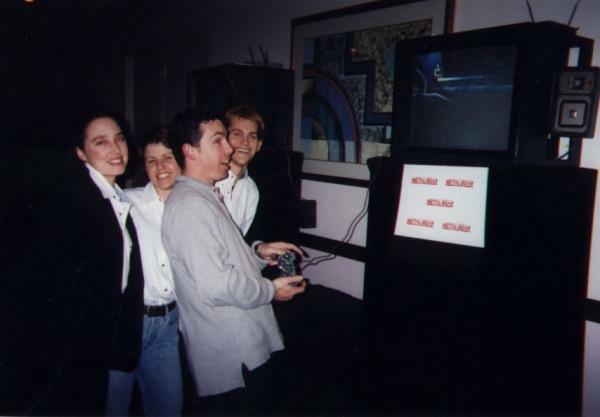 The GT Interactive team going hands-on with the original Metal Gear Solid on PlayStation at E3 1997 in Los Angeles. In the late 90's, New York-based GT Interactive became one of the largest video game publishers off the back of growth in PC gaming. 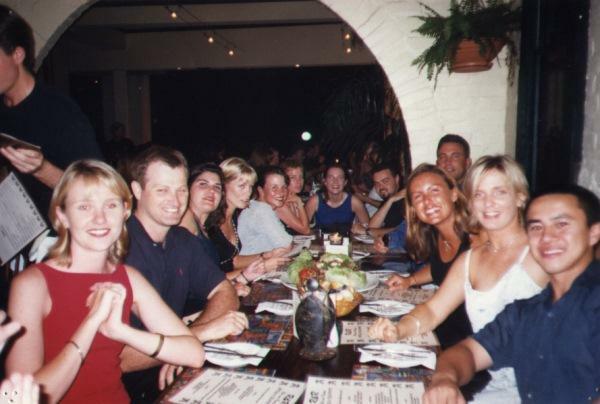 The Australian branch also grew exponentially after it was set up in 1997. However, as GT Interactive's global situation deteriorated, the company would be acquired, restructured and ultimately re-branding. Former GT Interactive staff, Edward Fong and Aaron Younger, look back at the distributor's run in Australia. Where were you before GT Interactive? Managing director, Edward Fong (EF): I was at Columbia Tristar, which is now Sony Pictures, in the home entertainment division. I was the marketing manager and I had been there for three and a half years. Through that association, we used to do the distribution for Electronic Arts. It was Julian White from EA who started up GT Interactive in Australia, which was initially a part of Warner Interactive. Julian gave me a call and asked me to join him in the start-up, which had one employee at the time. With the growth Julian had lined up, he wanted to gear up very quickly. I came into the marketing role and we had two other guys working at the time, both in the sales role, one operations assistant and of course Julian. Senior product manager, Aaron Younger (AY): I was a product manager at Sega Ozisoft, responsible for the third-party publisher program supporting the brands of Interplay, Accolade and Virgin, which then handled games by studios such as Westwood. EF: That was the beginning of GT Interactive, and interestingly we have gone on to stay in the industry. It was a great breeding and training ground for all of us, and back in those days, in the infancy of computer gaming, it was a great start for everyone involved. 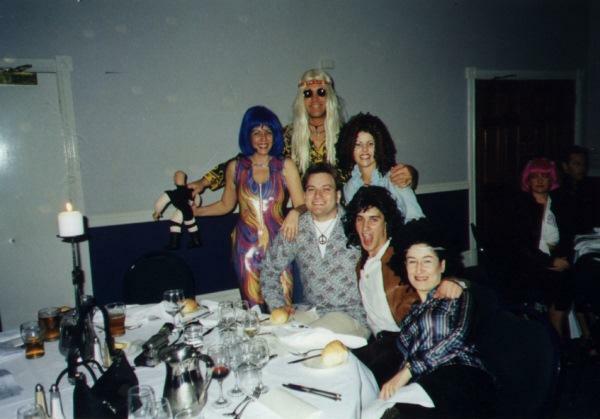 Members of the GT Interactive team wearing fancy costumes at a company event. What was GT Interactive like in 1997? EF: It was a meteoric rise and we grew very quickly. We started with the four of us and virtually zero revenue and grew it to an $80 million business by our third year. In that time, the team grew substantially as well. We put together some great campaigns in that time for some big releases for the PlayStation, its successor and the Nintendo 64, so there was a lot happening in the space. The Australian office had a great work culture which was quite unique for that time and probably harder to replicate today. AY: I joined GT at a time when the business was just starting to peak, so they had great studio content and were heavily focused locally on securing more third party content to boost their portfolio of product. EF: One of our biggest releases at that time was Oddworld: Abe's Oddysee, which was one of those great products which gave us the opportunity to be really creative from a marketing perspective. It was one of the biggest releases for the year and did some heady numbers. On Nintendo 64, we worked on bringing Duke Nukem 64 and Quake to the new console. The market had been dominated by PC up until then, so we were learning about the new install base of consoles. PlayStation obviously helped with that, and the original Driver was phenomenal. AY: My most notable memories during my time at GT would be the launch of Metal Gear Solid, Driver and Unreal Tournament. There were three incredible titles that significantly exceeded their unit and revenue targets. EF: We also had some great campaigns around our games in those early days. The buoyancy of the PC market back then was amazing and we were fortunate to launch Chris Taylor's first product, Total Annihilation. How was dealing with game developers and publishers? EF: Our headquarters was in the U.S. at the time but we didn't have a lot to do with the development teams, though we worked closely with development teams when executing promotional campaigns, such as the guys at Reflections for Driver. We had great relationships with the guys at Oddworld Inhabitants and founder Lorne Lanning, who was a brilliant creative mind, and we brought him out here on a couple of occasions. We would work closely with them on the marketing level and opposed to the development side, but we enjoyed a really good relationship. AY: We enjoyed great third-party relationships. Whilst we had a strong stable of internal studio content, we were always cautious in our selection process of third-party partners to avoid potential conflicts with our existing portfolio. 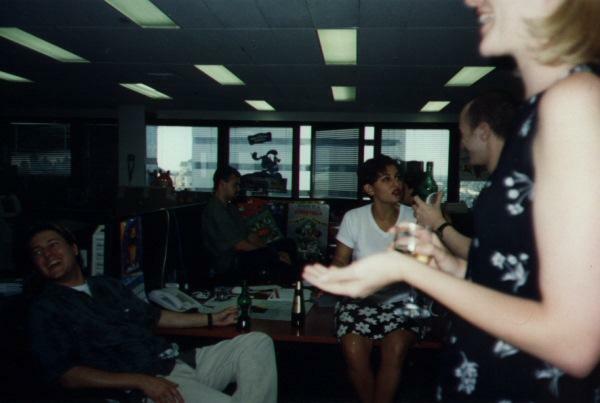 EF: Back in those days, we were one of the largest distribution operations in the country, not only for GT products, but also for THQ, Konami and many others. We released the first Grand Theft Auto and that had one of the most enjoyable campaigns that I worked on, because we went to the edge of the envelope with what was acceptable at the time. AY: We did always look to complement our catalogue with third-party content that did not conflict or compete with GT or other third-party publishers. This ensured that from a channel perspective there was no favouritism in titles, as all were represented equally. EF: I must admit that dealing with the international publishers that did not have a presence here was a challenge, so it came down to demonstrating our ability and knowledge of the market, but this is applicable to any industry. We managed to generate a lot of trust and confidence in our business here, and that allowed us to do more than we should have been allowed to do, because the publishers entrusted us with their brands and they knew that we were going to do the best job for them. In fact, GT represented only about one third of our business and the rest was distribution. We released Metal Gear Solid for Konami and wrestling games for THQ, so there were some significant numbers that we achieved in the Australian marketplace. The GT Interactive team at a company event. Which game launches stood out for you? EF: When we first showed Unreal at E3, people didn't know what it was. Epic wasn't as big back then as they are now, where they have become the standard for what they do technology-wise. When we first showcased the game at that event, quite a few people underestimated how big the franchise and technology was going to be, and it just goes to show that when you think you know everything, you don't and you might end up making a bad call. I suppose how you react to that decision is what makes a difference. At E3, we quickly realised how big this game was going to be, so we had to ramp things up from then on. AY: I was fortunate enough to work on this title and a number of other key releases such as Driver and the Oddworld franchise, and my two favourite launches would have to be Driver and Unreal Tournament. Driver being a new IP created an enormous challenge for us to inform, educate, promote and sell the title. I worked closely with Edward at the time and he was instrumental in supporting my ideas and initiatives to promote this title. It was also the first product we had created a local TV advertisement for, which we filmed in Sydney. EF: Unreal was definitely a favourite for us in the office, and one of the great things about GT was that we loved the games that we sold, and quite often we would waste away the hours in a LAN of Unreal or Unreal Tournament. We also used to distribute for Midway and the original NFL Blitz was a team favourite, so that took up a lot of our time in the office. AY: Unreal Tournament was my other favourite, as I was passionate about FPS games and just loved what the team at Epic had done with the Unreal engine, though we faced an uphill battle in promoting the game as Quake was the dominate FPS title of the time. Once again we did some innovative things with our marketing, creating limited edition red packaging for Australia and had several trophies built that mirrored the box image, which were then used for tournament promotions throughout Australia when targeting the core FPS audience. They were both fabulous products and a pleasure to have been a part of their history in Australia. EF: When the industry was in its infancy, there were some interesting surprises like that, where some titles would touch a nerve with the consumer. Oddworld was like that, as it was essentially a 2D platformer in a period dominated by 3D graphics. We brought out the game and the Abe character connected, and I still remember the billboards we put up all around Sydney with Abe farting. You could get away with that back then, but the industry is a bit more corporate now and you need to be a little more conscious of what you're doing, but we got away with a lot more back then than we could now. How did the work environment change over the years? EF: Because of the distance to the head office in the U.S., we pretty much did our own thing. We had the confidence and the trust of the head office to run our own operation, and the fact that our business was significantly larger than a normal GT office, because of all the distribution that we did, they pretty much left us alone. That meant that we could create and maintain the culture that we had. In those years we were very focused on our Australian business and keeping our parent company happy, but we also ensured that our third-party distribution partners were satisfied as well. AY: We grew rapidly during this time as the internal studio content expanded primarily through the addition of Humongous Entertainment, and by extension Cavedog, and we secured more third-party publishers to our existing stable. EF: From a cultural point of view, things did not change a lot as one of the focuses of the management team was to ensure that we maintained our great work culture. However, when Infogrames bought GT things did change. What happened in Australia was that we integrated the two companies; Infogrames, which had Ozisoft here in Australia, merged Ozisoft with GT. Even though they were the purchasers, a lot of the GT people received the management roles, so Julian headed up the APAC region. That meant that we could maintain some of that culture, but it was a bit more difficult. Whenever you merge two entities, there is always going to be a mixture of cultures and compromises. Eventually we created our own culture, and I won't say better or worse, but it was different. What we found was that a lot of the GT people left the business to move on to other things. The culture at where I work now, Ubisoft, reminds me a lot of the early GT days, and it's not by accident. 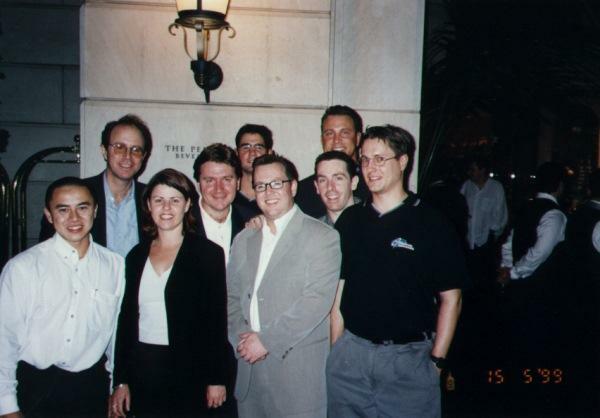 The GT Interactive team at E3 1997 in Los Angeles. How well was the Australian operation performing compared to US headquarters? AY: Australia was largely shielded from the loss due mostly to our third-party initiatives, as we were not totally reliant on in-house content to grow our business. EF: We were doing much better here, as GT was only a third of our business. That side of the business was down, but the rest of the distribution business propped us up. That meant that we didn't feel the effects as badly as other territories that didn't have distribution partners and only looking after GT products. We were a little immune to that and we took the whole integration process in our stride because we knew we had a strong operation here. Ozisoft in its own right had a strong business, and the melding of those two companies meant that we had a very significant distribution operation in Australia, and that continued in the years to come. AY: The third-party model ensured we remained relevant at retail and assisted greatly in maintaining our local market share. EF: I certainly didn't feel the ramifications of what was happening with the whole global business, though you would obviously hear and read about what was happening in the U.S., but we were so focused on our own business here that it didn't really make a difference to us. We still had investment and money in the business here, so we were still able to continuing doing what we were doing. There was little impact here, certainly less than in other countries. What did you think of Infogrames acquiring GT Interactive in 1999? EF: There was a question mark about what was going to happen, which office we will move into, and whether they will get rid of some people. Those are questions people would ask themselves in any situation like this. AY: I was surprised, though I had already left the organisation at the time to join Acclaim in Sydney to lead its marketing efforts. EF: We had confidence in our abilities, so when we integrated the two companies, I think we managed to keep most people happy. The toughest aspect was not knowing what was going to happen, so we sat down and worked it out. We had talent in both camps and it was just a matter of what the best way was to make it fit. Every merger like that you'll have teething problems, but I think we managed that change process pretty well and we created a stronger entity. At that point, we were the biggest distribution house in Australia, so we made decisions pretty quickly about who was going to do what and we soon went about our business. Anyone who didn't like it probably left of their own free will. Overall, it was a lot smoother than what it should have been, and that's a testament to the people that were making decisions. 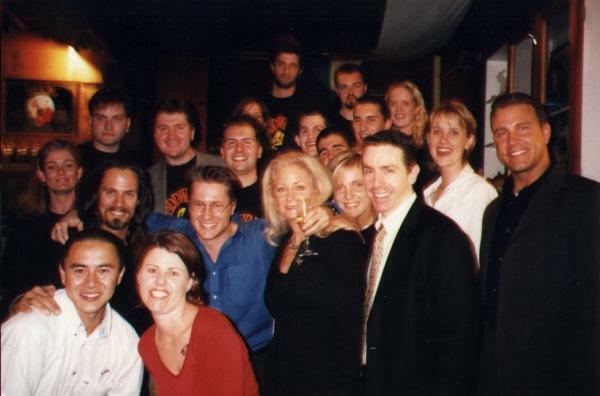 The GT Interactive team with the Oddworld Inhabitants founders during their Australian visit. What did you think of Unreal Tournament? AY: Unreal Tournament was the most played game in our office for the better part of a year in the lead up to and post launch. EF: I remember getting killed a lot while playing it. AY: We were highly competitive in the office and I still hold the crown of carry over champ in our inter-office competition. EF: It was a huge release for us at that stage as people knew the franchise. Unreal Tournament was one of those games, which we're now seeing with Call of Duty: Modern Warfare, that became ubiquitous for a genre. We had a head start, since we had such loyalty to the Unreal brand. Retailers were absolutely supportive of wanting to do more with the brand and getting it out to the masses, so it was a mass market campaign for us. There was a great PC player base back then and you had to upgrade your graphics card practically every six months just to keep up with the games. It was very much the case of the software and the content driving the technology. To play the latest and greatest game, you had to upgrade your graphics card. That's why we had such strong retail support, as they were getting added sales from our software. Unreal was state of the art back then and a great driver of that technology, so that meant we got a lot of support from the industry because it drove bigger business. How different was the company following the acquisition? AY: I had already moved on at the time, though I was still close to a number of the team. EF: It was a significant change, as you had two different cultures trying to meld together. It was a bigger office as well. All of a sudden we become a team of 50 to 60 people. With that you end up losing the intimacy that you had with a small team, which is always a challenge. As a team grows it gets difficult to keep connections with everyone in the business. The culture was different and I feel it was different enough that what we saw was that most of the GT people left the business. AY: I understand the business dynamics changed a lot and as a result most of the original GT crew departed for new opportunities. EF: The culture wasn't the main reasoning for the leaving, as they just went on to bigger and better things. It was different and I can't pinpoint exactly how, except that as it got bigger it became a bit more corporate. But then again, the whole industry has become more corporate. Back in the heady days of the Nintendo 64 and PlayStation 2 launches, they were almost pioneering days in getting out to new audiences. We have a larger install base now than ever before comprising of three big consoles, and with that there are different pressures on how you do things. Every company in the business has had to grow up and operate differently because the risks and investments now are much bigger, so you have to be a bit more pragmatic in how you approach the business. A day at the GT Interactive office. How important is it to adapt to this rapidly changing industry? EF: It's part of the industry maturing, and we've seen a lot of people mature with the business and we get good longevity; a lot of people coming in to the industry, like myself, are here for a fair while. Having said that, anyone who is here for a while is forced to adapt and grow with the business, as those that don't tend to be left behind. It's exciting and fulfilling for me to see people that I worked with over ten years ago still in the industry and doing well, and it comes back to the culture we set up back in those days. We prepped a lot of our guys to adapt to this growing industry, as one thing that is certain is change, and anyone that doesn't like it or can't adapt won't stay long in the business. Those that do stay are a testament to their ability to really adapt to what they do, and that's why we see such talented people in the industry. Were you surprised the GT Interactive brand disappeared? EF: We were so caught up in the moment that we never imagined it would turn out this way. If you ask me today what's going to happen in the industry in three or five years, it's hard to say. AY: The industry has changed a lot over the years from when I first started out in 1995, so many publishers and developers have fallen by the wayside. EF: We didn't have much time to think about what was going to happen, though we knew with Driver that we had a great brand and there were good legs to it. We also thought Oddworld was a fantastic franchise and we knew the vision Lorne had in his mind had legs. What happened later was that the franchise was sold to Microsoft, who took it in a different direction. AY: As a gamer I do get melancholy thinking of all of the great franchises I have worked on over the years, those at Sega, GT, Interplay, Microsoft and EA. EF: Driver, Oddworld and Unreal were franchises that we knew back then were going to have legs. Who would imagine that Driver would exist today and be released by Ubisoft to great success? The first game was big, the second and third games were so-so, but the new one is back to the heady days, so that was gratifying for me to have worked on the original one and now on the latest one. AY: I think as a product person you never expect the ride to end, but sadly in the economics of business it just doesn't make sense to continue to invest when the audience has moved on to other genres. That said, I was surprised to see Driver reincarnated by Ubisoft and felt the team did a great job in what is a highly competitive genre. I still love the original, though. What do you think of Duke Nukem Forever finally coming out? EF: We actually announced Duke Nukem Forever back then, so to see it released my reaction is "finally." Through all of its iterations and the different publishers owning it, it's a miracle that it finally saw the light of day. AY: We worked closely with 3D Realms at the time to build and prepare the marketing plans for the game, so we invested quite a lot of time and energy in putting these things together back in 1998. EF: The gameplay we saw back then, which they showed us to demonstrate the direction they were taking the game in, was phenomenal. I remember sitting in GT Interactive's office in the U.S. and seeing what they wanted to do with this brand after having just released Duke Nukem 64 and thinking that it was going to be groundbreaking. So we knew there was something there, but for it to take more than ten years to be finished and released is a bit longer than I expected. AY: I still have an original Duke Nukem statuette that was created exclusively for the franchise launch. I believe it is the first one out of 500 ever made, though given the performance of Duke Nukem Forever, I do not foresee its value as a collectable increasing dramatically. EF: I'm so glad that the game finally saw release, though I was a bit disappointed that it didn't do as well as everyone hoped it would. I guess building up expectations for over a decade will end up disappointing some people in the end. I was excited about the franchise since day one, and every time there was a new announcement or press release, I would read it with great interest. Duke Nukem Forever deserved to be released, so I'm glad they got it out.